After taking lessons from several coaches, I noticed some very fundamental differences between their approaches. My current coach is very good at giving a one point advice based on my swing. Although one day I would like to swing like Ernie Els, right now I am settled with my ugly swing and happy to experience the notable score improvement after every lesson. That is quite different from the lessons that my friend took. His coach basically asked him to forget all he had learnt and tried to revolutionize his swing in order to take him to the next level. He is scared to go to the course now because he is stuck with a setback before he can get any better. He however believes that he is taking the necessary steps towards his goal of turning professional someday. What are your long and short term goals and which approach is more suitable for you? 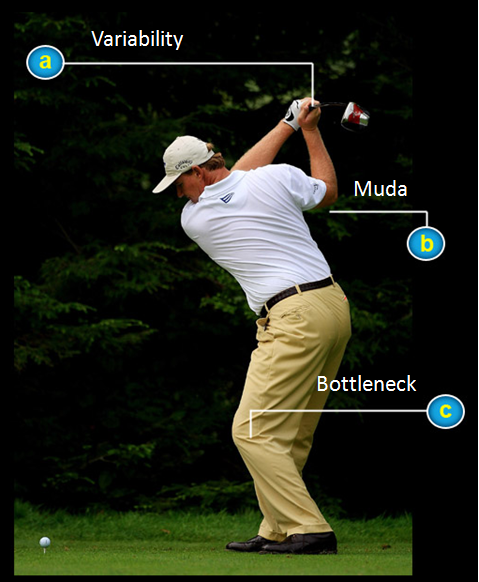 You should focus on eliminating muda in your swing. Do not try to “push” the club head towards the ball but rather let a synchronized body turn to naturally “pull” the club head in order to achieve a smooth flow of your swing. 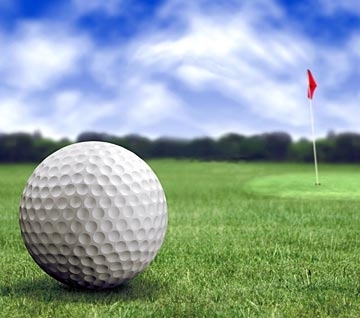 The game of golf is a process of relentless continuous improvement. We do not generally recommend you to invest too much energy to your tools because dependence on such frequently undermines the development of the correct mindset. If you focus on improving every little piece, your efforts will eventually show up in your score and hence your handicap, which should not be your ends but means to the way of golf. Golf is a game of consistency. You should hence focus on reducing variability of your swing. We have a set of statistical tools to measure the defects of your swing as well as scientific instruments to monitor and track your progress. You need to certify your skills from green to black belts. Through leveraging the right tools with scientific measurement and objective feedback, you will ultimately reduce your swing variability to under 6-sigma. You can maximize the return of your practice time by focusing on identifying and improving the bottleneck. At every stage of your skill development, there is a constraint that determines the throughput of your entire game. At one point it may be the grip or the address or the swing plane or approach shot or putt … but the point is that the bottleneck moves. By identifying the bottleneck and concentrate on it, you will be able to get notable handicap reduction within the shortest time. While lean and six-sigma can get you closer to the “perfect” swing, TOC focused on optimizing what you have already got to quickly improve your score. Whatever the approach you pick to improve your golf game or to help transform your manufacturing operations, you can benefit from applying technology that automatically records your current swing (or process) to then give you instant feedback on what to improve. In my opinion, there is no better example than golf to illustrate how your actual execution can be deceptive to the best intended plan. One of my customers is meeting with the following problem: how to optimize production batch size during an upcoming national promotion that will greatly increase demand? The end products are sets of sockets, each of which has a different diameter. An important challenge is that demand is in “set” that include many different diameters but actual production is grouped by “sockets of the same diameter”. This is because significant change-over time is required to setup the bottleneck forming machine for production of a given diameter. Such change-over time varies from 2-4 hours. In some cases it can take an entire shift. Therefore until now, they have grouped sockets of the same diameter by product batches. Such “lot-for-lot” production is simple to execute and minimizes the number of change-over required. However, their business model has recently changed. Marketing is trying to conduct a national promotion on certain sets. Therefore the demand of a number of sets will be greatly increased. This creates a new problem for using “lot-for-lot” rules in production. If you focus on making 1 diameter before making the next one, then you will accumulate a lot of inventory before you can ship sets. The cost of holding inventory and the responsiveness to demand fluctuation will become a much significant problem than when demand is in smaller batches. Given that, should you divide the demand quantity into smaller batches and if so, how should you determine the size of which? Assuming that each set has 5 pieces and each piece cost $10, we can calculate the following 2 cases with setup cost estimated at $100 and inventory holding cost for each piece estimated at $0.04 per day. Notice that when taking both setup cost and inventory holding cost into considerations, it is actually cheaper to divide the demand into 2 batches (Case 1). Note that there is 5 change-over required for gather 5 diameters of sockets for each set. 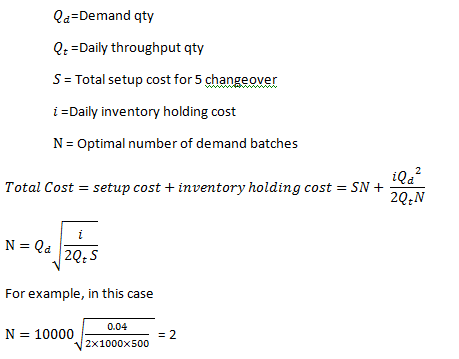 Therefore the smaller batches of demand, the higher setup cost but at the same time inventory holding cost is reduced. What happen if we further divide demand into smaller batches? Our analysis is showing that further reduction of batch size from Case 1 to Case 3 has increased the total cost. Therefore, under the given conditions, the optimal demand batch size exist somewhere between 2000 and 10,000. How to determine the optimal batch size? At first glance, this may seem like a case that requires dynamic lot-sizing procedure of Wagner-Whitin or the like because demand is not constant. However, this problem actually can be simplified and hence solved in a similar way to EOQ calculation. Therefore the optimal demand batch size is 10000/2=5000 which is case 1 and the total cost is about 18% lower than “lot-for-lot” production of case 2. On the other hand, it is important to further reduce setup time in order to reduce overall cost and improve demand responsiveness. For example, if S is reduced from 500 to 100, N can be calculated to 4.47≈5 and hence a demand batch of 2000 with a total cost 30% of the original total cost of case 3. I have frequently come across factories that keep a lot of on-hand stocks and at the same time material shortage is among the top reasons of unexpected production downtime. Same goes for retail operations that have kept safety stock level arbitrarily high. More often than not, shortage is not reduced by keeping more stocks. At first glance, this seems to be counter-intuitive. After all, textbook stock management models always indicate that safety stock level and the probability of shortage, which directly affects service level, has an inverse relationship. You reduce stock and you end up increasing the chance of shortage, which leads directly to loss of sales opportunity. On the other hand, more stock means more working capital, more product obsolescence, more warehouse cost …etc and hence serving customers is a financial tradeoff between shortage and stock levels. In practice, this is not necessary true. In fact, I argue that in order to reduce shortage, you need to reduce your stock level first. Typically a fixed budget is allocated for procurement. High stock level reduces the flexibility of allocating budget to purchase what is really needed. This is very commonly seen not only in retail but also for large manufacturers’ raw material procurement and sales company operations. Excess stock level tends to create an inappropriate peace of mind for managers. When less attention is given to keep stock level low, larger variability of turnover among SKUs is resulted. Replenishment of the SKUs that are really needed by operation is hence more likely to be forgotten. This is the classical lean wisdom that when stock level is excessively high, problems are hidden behind the stocks. There is no pressure to improve supply chain responsiveness by reducing manufacturing lead time or improving overall material flow synchronization. Eventually, demand and competition will catch up with the limitation of the supply chain responsiveness. For example, studies have shown that US automobile manufacturers tend to keep higher dealer stock than their Japanese counterparts. This has been one of the major differences in competitiveness between US and Japan automotive companies. Classical inventory model assumes that inventory decouples supply and demand functions. In practice, supply chain is complex and you cannot simply decouple supply and demand with stock. The key success factor to reduce shortage by reducing stock is to actively manage the complex relationship by better synchronization of manufacturing with customer demand. Better synchronization can be achieved in 2 ways: more accurate forecasting and higher flexibility of execution. In today’s market of increasing demand volatility, there is a limit on how accurate you can predict the future by improving forecasting. However, lean methodology has taught us that there is almost no practical limit in improving execution. Take the example of a manufacturing plant that I visited recently. They make products that are distributed across US through a franchise network. 5 years ago, their plant inventory alone was at 90 days and they only met 70% of customer orders. Today, their plant and downstream distribution center total inventory is less than 80 days while they are now meeting more than 96% of orders. The key to this change is that the manufacturing plant now is accountable for not only the plant inventory but also downstream DC and soon warehouse inventory. In this case, the overall stock reduction target has put manufacturing operation under pressure to reduce lead time and improve flexibility. Any such improvement has an impact to downstream supply chain stock level as well as customer satisfaction level. Such improvement cannot be achieved when manufacturing and supply chain stock are managed separately as silos. In order to achieve the next level of operational performance, they are evaluating a unified IT platform across manufacturing and supply chain. By the same token, manufacturers are now using the latest information technology to synchronize better with their suppliers. An industrial equipment manufacturing plant that I visited has implemented an IT platform that allows them to see in real time the progress of WIP at its suppliers’ production lines. Such visibility allows them to control material synchronization between key supplying parts and the in-house final assembly operations, resulting in overall inventory and shortage reduction. Are you wondering why your operation is keeping high stock level but still cannot reduce shortage? Do you see your manufacturing operation driving supply chain stock management? What is keeping your manufacturing operation from better synchronization with supplier operations as well as market demand? This turns out to have something to do with the natural law of business process. Take the example of order fulfillment which is their most important metric. They were at 70% 6 years ago. A yearly target of 5% improvement has taken them to around 96%. But then, they are hitting a wall. Well why should the last 5 % be more difficult than the others? The basics of 6-sigma would cast light on this problem. Going from 70% to 96% is the journey of going from 1 sigma to 2 sigma. The natural law of business processes says that it will require the same level or more effort to increase every sigma level. Frequently it is a totally different ball game that requires significant resource investment, skill acquisition, technology advancement and cultural transformation to ramp up each sigma level. They have been relying on automation and Lean methodology in the past 6 years and have succeeded in the journey from 1 to 2 sigma. In order to get to 3 sigma, I have suggested them to start applying scientific and statistical tools to business processes. Without taking more detail measurements and applying appropriate quantitative methods along with Lean, there is a limitation on how far that they can further improve. It is indeed a different ball game that they are more than ever in need of enabling information technology to get them the data and visibility required for scientific management. Years of neglect in IT investment at manufacturing may come to a point to limit further growth of the operation. Does your operation set key improvement targets, the associated resource and infrastructure investment based on target 6-sigma level? How far can you go down the 6-sigma journey without implementation of enabling information technologies? Earlier last year there was a provocative posting at The Washington Post literally indicating that top executives at HP believe that Detroit should be left out to die. The article a rgues that instead of bailing out inefficient industries, US government would be better off funding Hi-tech industries who know how to stand up on their own feet. A few months earlier, Tesla’s CEO Musk Elon who founded other high profile companies including PayPal, Zip2, Solar City and SpaceX, has decided to put his manufacturing base at California in order to tap the portfolio of Hi-tech talents in the vicinity. The EVs are powered by electrical powertrains that only have a single speed gearbox, which eliminates the need for complicated clutch and shift mechanism. The underlying development and production processes for such calls for very different domain of knowledge than traditional automobiles. Building on the supply of Hi-Tech professionals as well as the dynamic, open, and competitive culture of the Valley, Tesla has made some marks at not only product innovations, but also leveraging outsource manufacturing and building a store-based retail chain. Tesla turned profit the first time in July 2010 and has just raised $260M from its June IPO, which is the first car company went public since Ford in 1956. “I’m against having a two-class system where you’ve got the workers and then the managers, sort of like nobles and peasants…” Elon remarked on the working culture of Detroit in an interview and claimed “I’d like to have a conversation with whoever’s in charge at the time — the car czar or whoever — and say ‘I’d like to run your plants“. While the Valley has a history of successful companies growing out of garage operations, Detroit executives may well shrug off such attempts as unrealistically ambitious with good reasons. “People have tended to underestimate the complexity of doing a car. This has been true for the ages” said a Michigan automotive insider. In fact, despite the aggressive claims made by Silicon Valley executives, EVs are still only sold at small volume in a niche market that has so far confined their competition with Detroit more to the media than at major marketplaces. A closer look at these Silicon Valley start-ups, one may find that their fates are not so independent of the big blues. Tesla for example will supply Daimler with their electric powertrains. In turn Daimler has invested and owned 10% of Tesla which has acquired Nummi facility that was run by GM and Toyota to build Model S. Tesla’s peer / competitor Fisker is sourcing its engine from GM, who is planning to follow the path of Tesla to go IPO in Oct. Such interweaving relationships between start-ups and old timers represent an industrial dynamics that one may find to be quite characteristically American. In fact it is hard to imagine how these young companies can grow further without leveraging the supply chain, the sales channels and the wisdom that has took the big blues decades to build. Having the privilege to work with both ends of the spectrum, I would suggest that such genetic crossover has been propagating at many levels. For example, we included full containment / traceability capability to even the initial phase of a project at a start-up EV assembly operation, which was supposed to focus on ramping up of product volume. The containment capability though hard to be justified by superficial ROI analysis, is a wisdom borrowed from the big blues that an insurance policy of your brand is always worthy. After all it only took 1 instance of a highly unlikely event to bring down billions of dollar and decades of effort in building up say, BP brand. On the other hand, we provided a manufacturing IT platform for a hybrid battery plant built by one of the big blues. Flexibility and scalability is not only essential for start-ups to grow but also for new technologies to be fostered under a mature corporate environment. It is way too soon to speculate on whether the Silicon Valley car ventures are going to achieve what Apple did to IBM, Digital and Wang, or to end up like many other soon-to-be-forgotten “New, new things” such as Healtheon or Webvan. If Silicon Valley appears to be at war with Detroit, it would be more a manifestation of the healthy tension that is essential to strike the balance between risk-taker and cautious venturer, revolution and evolution as well as innovation and management maturity. This intriguing dynamics between start-ups and big blues may well be one of the ultimate strengths of the US economy. Why is there always longer wait time before but not after a Par 3 short hole whereas you are supposed to finish a Par 3 faster than other holes? How should a golf course manager decide the release timing of player groups to the course in order to maximize revenue while minimizing wait time? What would be the impact on wait time and throughput if we change from 4-sum to say multiple 2-sum or 5-sum? What are the causes of inventory before a workstation? What is the nature of the bottleneck? How should release time of orders be decided in order to maximize throughput and minimize cycle time? What is the impact of changing batch size on cycle time and throughput? Staring at walls has been the way buddhist monks meditate about the ultimate truth but hardly seems like a way to inspire making of national industrial policy. Though for the prepared mind, the subtle architectural differences in these ancient castle walls could be telling a hidden secret for the modern industrial world. Typical Japanese castles are built on irregular stone walls called Ishigaki. At first glance, these ancient irregular structures may seem to be some primitive work of an underdeveloped society. The fact that these seemingly random combination of rocks has sustained more than 400 years of wears and tears by wars, floods and earthquakes, may come only as an afterthought. A closer look would discover that mortar is not used in binding but rather small rocks are used to lock large rocks into their positions. This technique allows for water passage that prevents water pressure from building up inside during the rainy season. The uneven distribution of mounting forces as a result of the irregularity constitutes the strength against attack from both human and natural disasters. One can also deduced that building these walls required close communication of the workforce and a distributive chain of command. Decisions were made at the frontline to deal with irregularity at each step without losing sight of the overall goal. In contrast, castle walls outside of Japan are typically built with standardized rectangular blocks. The regularity reduced the need for communication among the frontline workers. In fact the workforce were frequently composed of members from different tribes who spoke different languages. Such standardization allowed any missing piece to be easily replaced and so as working members of the team. Minimum decision-making is delegated to the front line in the building process. Many of the characteristics of the workforce behind those walls have served to establish competitive advantages in the modern industrial economy. According to the framework developed by Professor Fujimoto of Tokyo University, there are modular and integral types of industrial products. The architecture of Ishigaki is one of integral whereas that of western castle wall is one of modular. In the former case, any components have complicated interface relationship with the rest of the system whereas the later has relatively simple and standardized interface. Types of interfaces can be categorized to open and close, depending on whether the interface standard is open to the industry or proprietary to a single company. This framework of architectural classifications reveals a type of national competitive advantages rooted from cultural and historical characteristics of the underlying society. Japan has been typically strong at integral types of product which requires an integrated quality control as well as close communication of the workforce and supplier network. Such strengths could be attributed to the cultural environment developed in an island country with a rather homogeneous population. Examples of successful industries are electronics, Hi-tech and automobile. US has been quite successful in formulating industrial standard and globalizing operation at a large-scale as seen in the success of computer and software industries. A strength that could be traced to the social environment of diversed immigrants. I used to work in the disk drive industry and this framework has given me insight to the kind of industrial dynamics that I had experienced during the mid-90s. I was in charge of the quality of magnetic media (disk) manufactured by Japanese suppliers to Seagate, the world’s largest HDD manufacturer. During the year 93-96, magnetic head and aluminium disk technology has approached maturity. Seagate had successfully standardized the head-disk interface and outsourced disk production to several suppliers in order to take advantage of cost and supply flexibility advantage to meet market demand. Seagate was beating up competitors such as Western Digital, IBM and most Japanese manufacturers in the game of commoditizing disk drive and its components. The company was the first one in the industry in expanding production to Singapore, Malaysia, Thailand, China and Ireland. The key in such expansion is to simplify and standardize interface between components in order to reduce communication cost that come with expanding supplier network and globalization. During the late 90s, new technologies such as Giant MR head and ceramic disk had become important in further reducing size of HDD and increasing memory density. The head-disk interface had become more complex and many previous unknown issues related to applying new technology to mass production environment such as thermal asperity were causing serious drop in production yield. In this sense, product architecture had shifted from modular to Integral. In order to stay in the game, Seagate took prompt actions in taking over Corner (the world’s 3 rd largest HDD manufacturer at the time) in order to secure supply of disk and vertically integrated the head and disk divisions. The newly integrated organization was much more efficient in dealing with the complex quality issues that came with new technologies than the former structure of multiple suppliers. I cannot confirm whether Seagate executives derived their business strategy by staring at the castle walls. However, I have come to realize that business strategy as well as supply chain and organizational management need to reflect product architecture. Why policy makers and corporate Executives should pay attention to these walls? During this economic downturn, corporations are being blamed by politicians for outsourcing jobs to China and low-cost countries. Policy makers are inclined to promote protectionism. Such policies are more outcomes of emotional reactions than careful plans for sustainable competitiveness. A lesson to learn from how Japanese government had deal with its recession in the 90s would be giving more considerations to product architecture when formulating industrial policy and strategy. US government could help to foster and maintain stronghold on open modular industrial product and fund information technology and development of structure that improve integral products. Social policy should be adopted to tackle unemployment instead of industrial policy. As a suggestion, politicians and policy makers should spend some time meditating in front of the Japanese castle walls because the lessons learnt from looking deeper into the root of the nation’s core competitiveness could help navigating through crisis and prevent them from being carried away by mere emotional responses of lobbists.